Fash-insider brides know to look for a moody wedding aesthetic as it can be used all year round. Say goodbye to being stuck with a bright toned palette in the summer and pastels for spring. Let your inner-fashionista and these inspo ideas guide you. Royalty anyone? 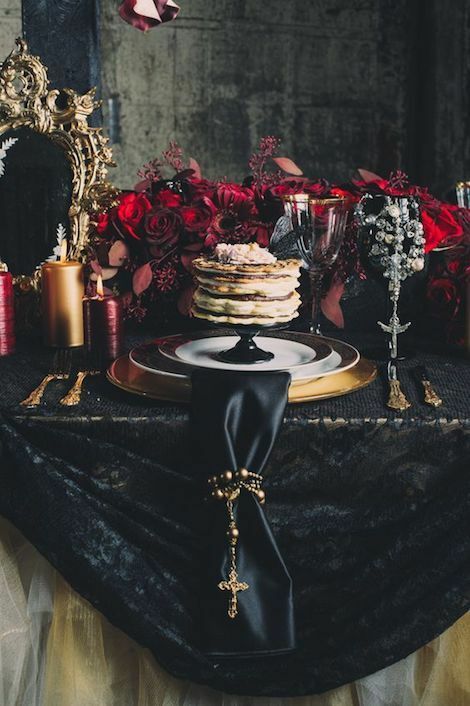 Heads over heels in love over this dark & moody wedding aesthetic. Black, crimson red and gold. 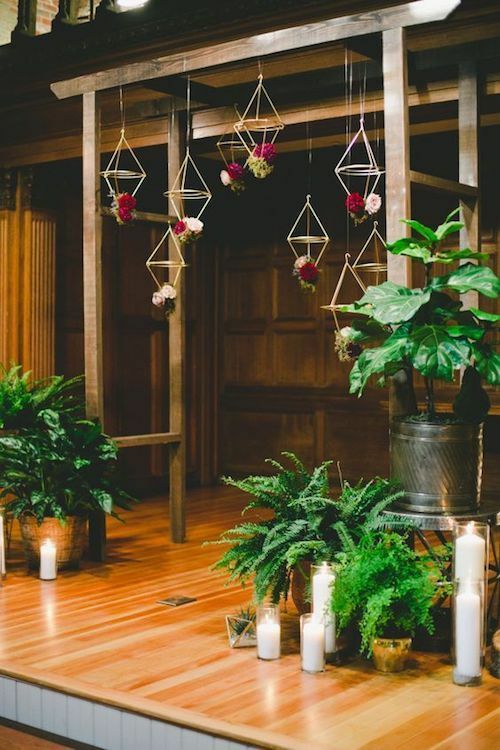 Join us in the dark side and fall in love with this moody wedding aesthetic. Since your proposal, you’ve been flipping through wedding magazines and drooling over Pinterest boards. 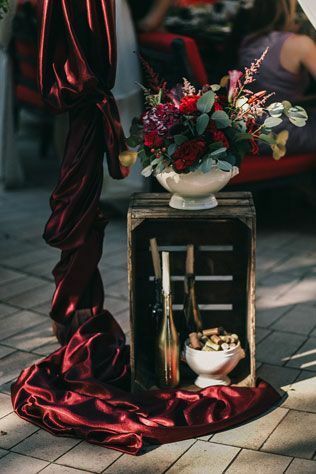 Those intriguing and downright gorgeously dramatic wedding photos have you dreaming about deep reds, ultraviolets, and burgundy colors. You have been envisioning a wedding with a romantic and dark allure. 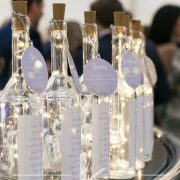 So, say au revoir to feeling stuck with white, pink and pastel hues and embrace the darker side of the wedding palette. 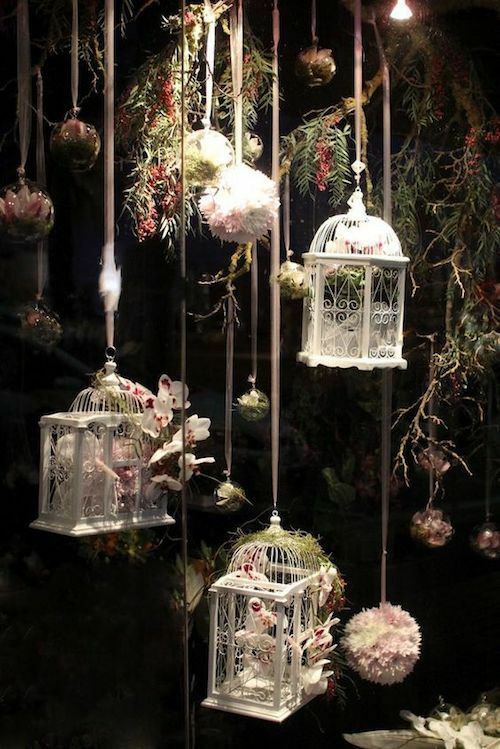 Related: Romantic Enchanted Forest Wedding Ideas: Let’s Create The Dream! 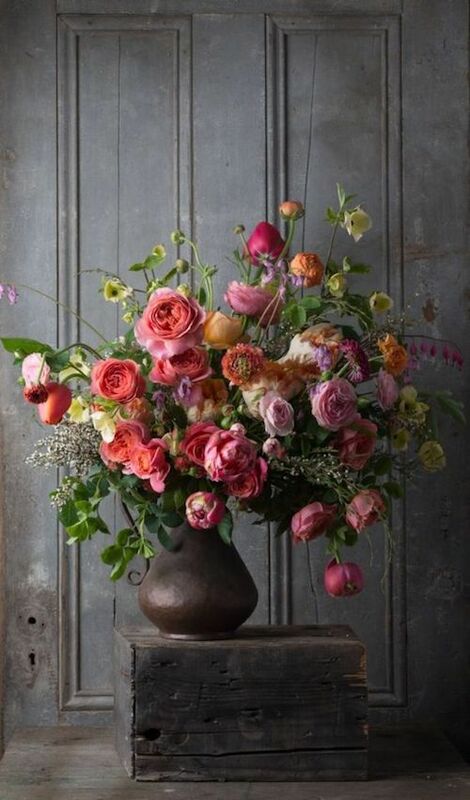 For those who have chosen spring for their ceremony, a good place to start implanting those moody colors would be in the florals, like the bridal bouquet, or the centerpieces. Rich burgundies, lovely creams and deep sages can be lovely base points to begin with. 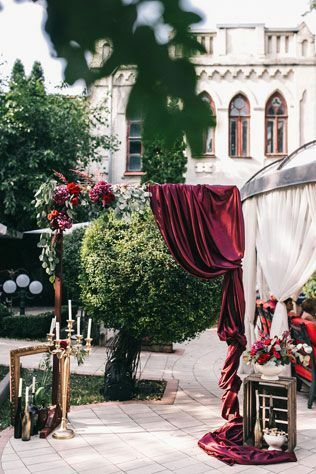 Going for a dark and moody wedding aesthetic does not mean you have to turn away from lighter tones. Just taking the aforementioned colors and mixing them with your pinks or with lovely peachy hues doesn’t mean straying from your vision. 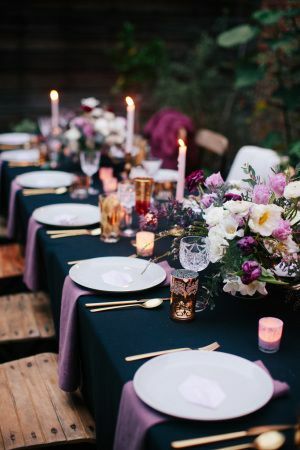 To help set the scene you can go as small as adding tapered navy blue candles or as big as burgundy drapes and rich crimson florals mixed in with ultraviolets, greenery, and lilacs. A touch of pink mixed with moody colors for your springtime wedding decor. Super original jewel toned cake stand. Finds: vintage desk, blackboard, eucalyptus leaves, black and burgundy candles and gold candelabra. Cake, of course. 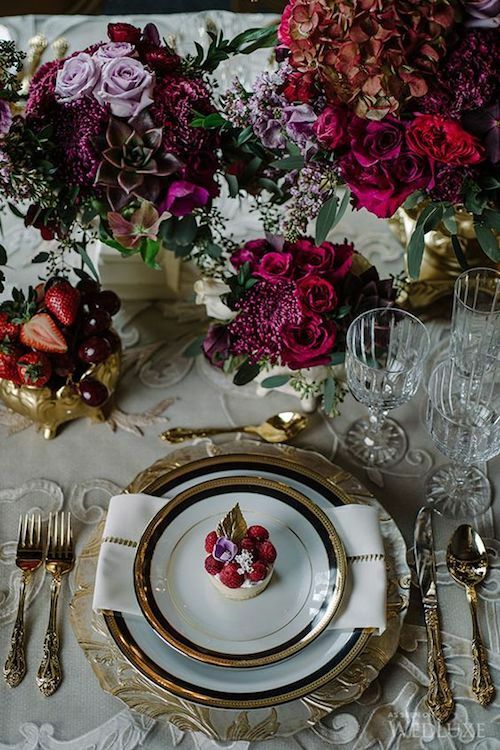 Golden charger plates and filigreed plates denote luxury on this spring moody wedding aesthetic. The grape and strawberries accompaniment is perfect for this season. Photography: Mimmo & Co. Guess the season. 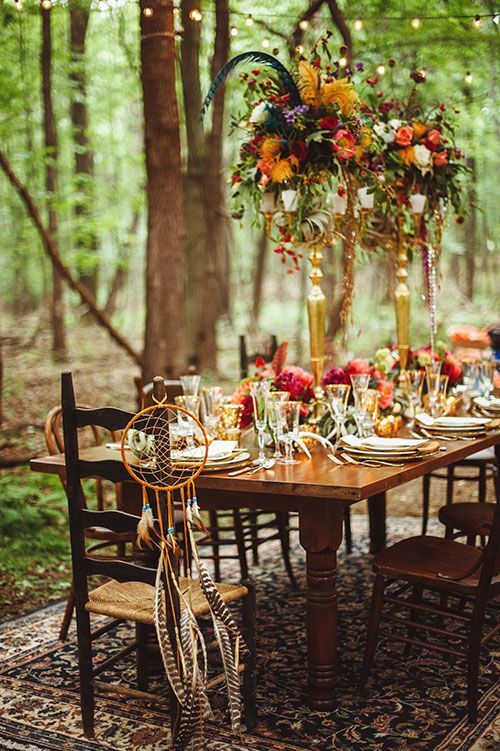 We can assure you that this boho-chic table decor will wow all your guests. It has been tons of fun building your mood boards; if not a little frazzling. In fact, there are probably tons of plans scribbled all over your place. However, taking this information from your wedding vision board and turning it into a reality may seem impossible. Doing so middle of summer can seem difficult. Don’t worry, truth is as long as you have a vision; the ability to execute it isn’t that far off. Turn them into a reality with the help of these summery images with a dark and moody wedding aesthetic. 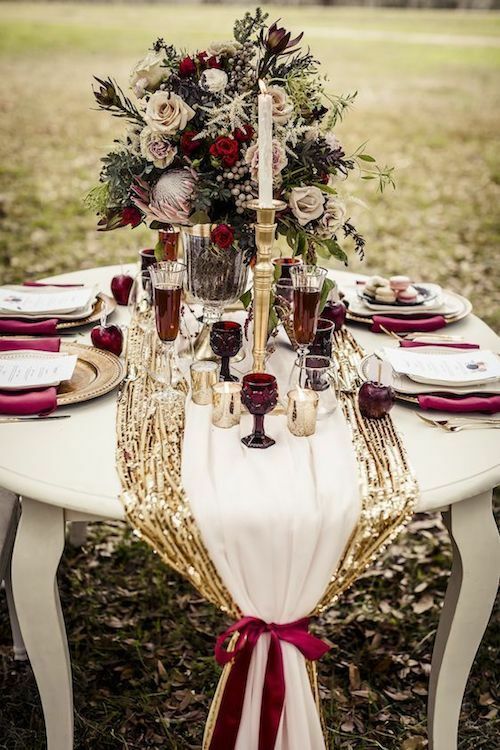 Drapes and flower arrangements in deep burgundy tones. No need to be overly dramatic with moody colors. A few splashes will do, like on this flawless ceremony backdrop. For those with summer wedding dates; you’ll be happy to know that violet, lilac, and burgundy, have become a favorite in wedding attire. Feel free to mix them up with strong colors like fuchsia or Gen Z yellow for a festive summery feel. 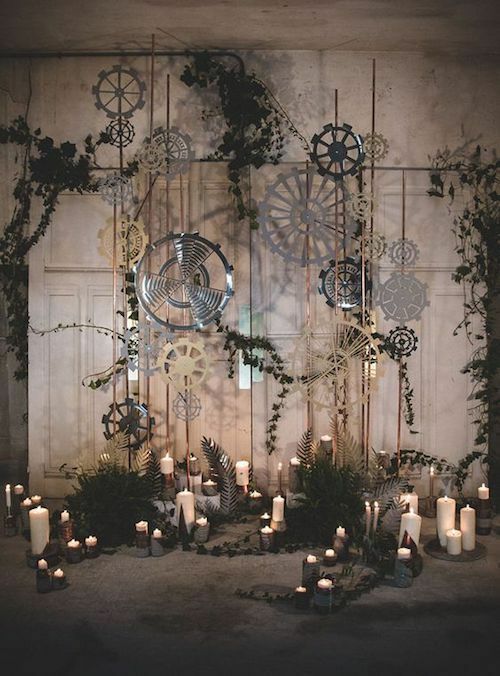 Industrial venues are ideal to create an ultra romantic vintage moody wedding aesthetic. 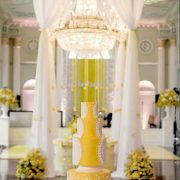 All you will need are special corners, creative photo booths and a cake tablescape to wow your guests. Black is not out of the summer wedding montage. It has found its place amongst candles, place settings, drapes, and even wedding cakes. 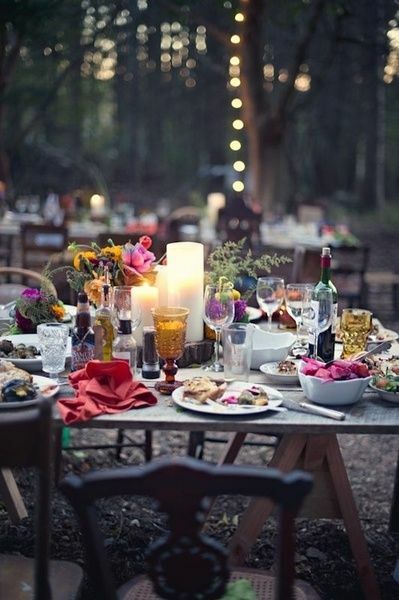 As for decorations if you’re one who loves the rustic vibe, and want to embrace this trend, think woodsy, not rustic. Doing so will offer a perfect embrace to those deep color options. Yes, summer means color. But nobody said which colors, amiright? 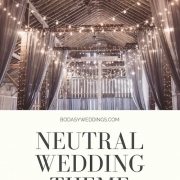 The moody wedding aesthetic gives life to a summer affair. 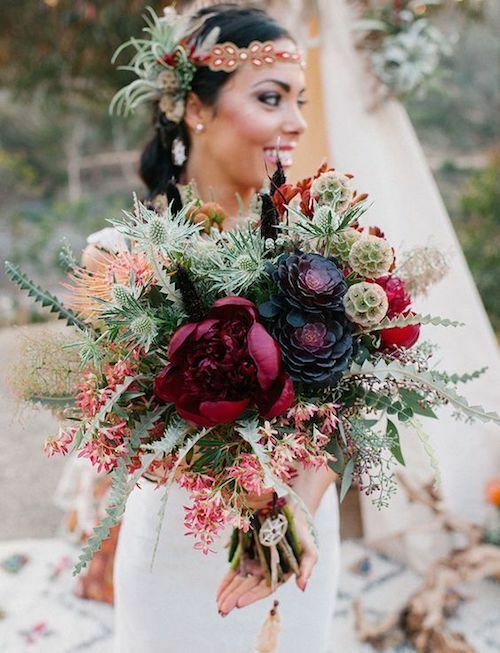 This boho folk bridal bouquet incorporates the rusticity of the desert and the rich hues of a dark and moody vibe. There’s no need to go ultra goth or Halloween-y to get a dark & moody vibe in the fall. 2018 has yielded the perfect niche for those with fall ceremonies. Lovely violets paired with forest greens will give your build the romance and drama you are trying to convey. Jewel tones against brown tones will turn any wedding venue into a Pinterest-worthy event. Remember, to toss in some wood elements; with some romantic light displays to round out your theme. 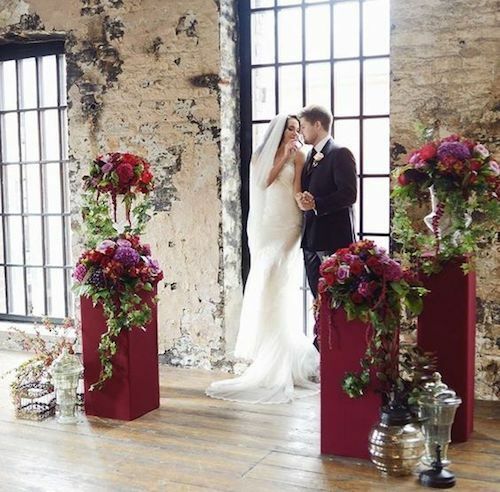 Industrial spaces are perfect for the moody wedding aesthetic. 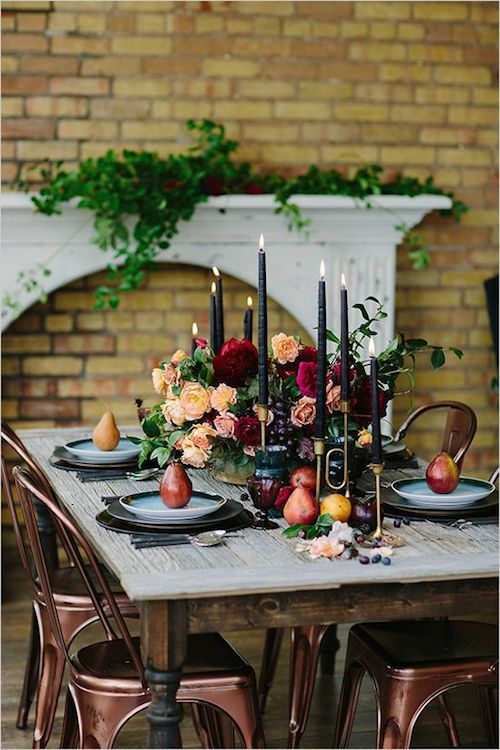 Navy blue candles, copper, brass, red and peach tones for deep and luxurious fall ideas. 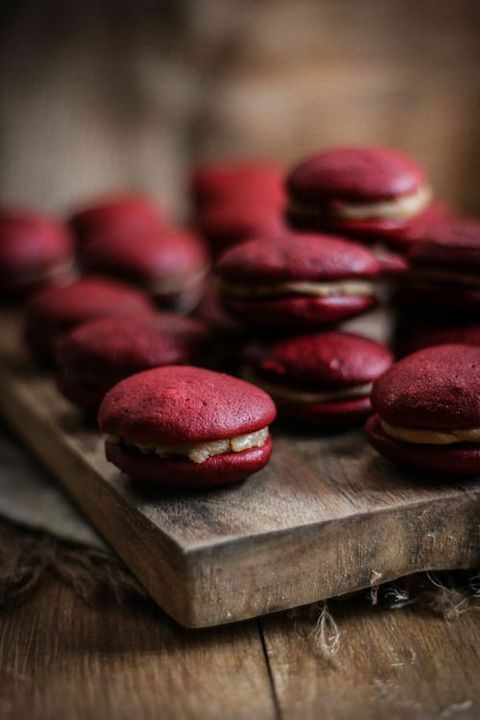 Feel free to incorporate these reddish brownish colors to your food. 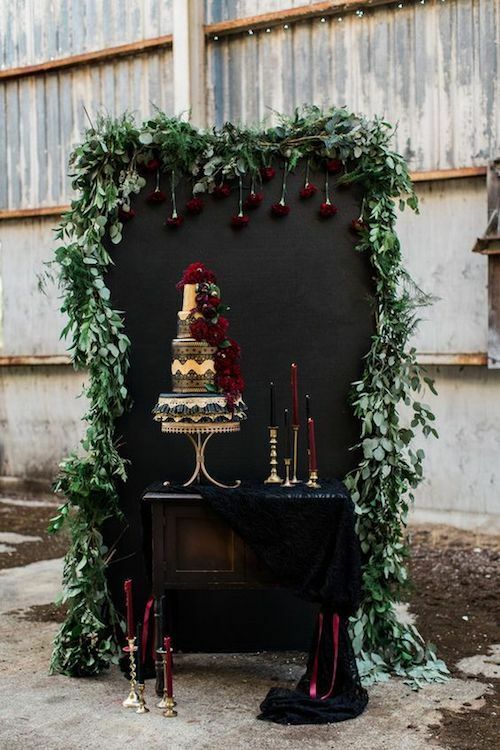 As for those whose nuptials are during the wintertime, why not display an edgy and fun vintage black wedding cake with floral accents. Include frozen flowers in your ice cubes to give the moody wedding aesthetic of your dark romantic day a bit more flare. That along with candelabras surrounded by vast greenery and lovely floral accents on a formal table setting; will have your event being counted as the chicest one this year. Winter tale vintage woodland wedding decor. Blush, pink, gold, ivory and burgundy for a soft and feminine wintery feel. Let the wine and votives take care of the rest. 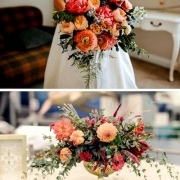 Breathtaking florals for a moody wedding aesthetic. Def trending. For a winter affair dress your tables in navy blue and liven them up with some pops of pink. The wooden chairs give it a more outdoorsy look. Switch them for clear ones for a modern aesthetic. Anna Wu Photography. Everyone knows that encapsulating the perfect theme, is one of the crucial stages of planning a wedding. It sets the tone for one of the biggest moment in people’s lives. Bringing the choices of the faultless dress, ring, and lifelong bae into perfect harmony. No pressure, right? Well, now what was once the cornerstone of many fall and winter ceremonies can be had throughout every season. Photo Credits: instagram, 100layercake, tumblr, greenweddingshoes, weddingchicks, happywedd, the perfect palette, brides, himisspuff, elle. 05/05/18 /0 Comments/by Havi G.
Combinaciones de Colores para Boda Azul de Ensueño ¡A Copiar! 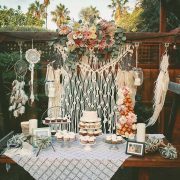 40+ Extraordinary White Wedding Ideas & Decor: Swoon!